Today was a good day with the kids – no one lost dessert privileges; homework was done by 8 pm; they all cleaned up downstairs and put away their clean clothes. Bed by 8:30. YES. But I’ve missed Eric a lot today. I told our neighbor friend who seemed worried about us that we are pretty good at the routine when he is gone, but I really miss his partnership and friendship in my day to day life. So do all the kids! We can’t wait for Friday night. Eric managed to call briefly before dinner, as they were finishing up taking out Mrs. Suzuki’s floor that had been ruined by the tsunami and putting down a new one. He said the Hawaii team is awesome- they are working incredibly hard, and one of the team members got in trouble from Mrs. Suzuki for trying to wash her dishes. He had to go because the team was closing their day by praying with and for Mrs. Suzuki. Love that. My friend Yuko M. told me she made salmon karaage for her family the other night and her one year old son Joshua kept signing “more! more!” So tonight I made a version of her recipe – easy and oh so good. It was fun making a Japanese meal for the kids; Owen in true Japanese fashion has requested the leftover miso soup, salmon and rice for breakfast tomorrow. We all decided Daddy would have liked dinner tonight. Coat each piece completely with cornstarch; deep fry in oil for 3 or 4 minutes. 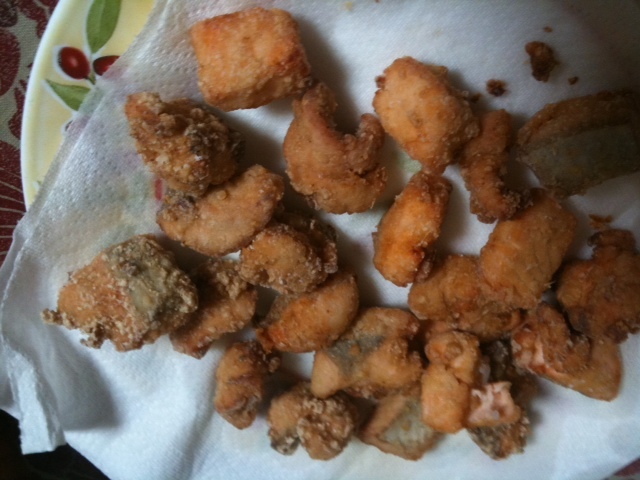 Thanks for the recipe for Salmon Karaage. I’m going to try it soon. Looks like a good thing to add into bento too. Eric will be home soon! Love you Sue! That recipe sures sounds YUMMY! Thank You, SUE!!!! I remember you all before our Father as I go through the day and spend time with HIM. I pray you will have a sense of HIS PRESENCE there with you and the KIDS…and with Eric and the crews at work up north.